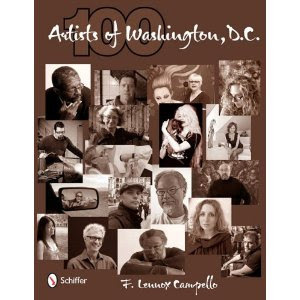 For some reason, some of you are having issues getting the 100 Artists of Washington, DC book on Amazon - an alternative is Ebay, where a few book dealers have the book now and it ships free! Check them out here. Check out the 100 Artists of Washington, DC book release party great photos by the Washington Posts's Rebecca D'Angelo for The Scene column - see the photos here. Last Saturday, as I scanned the large crowd that had braved the extreme heat to gather at Conner Contemporary’s gorgeous gallery space to celebrate the release of the 100 Artists of Washington, DC book, I also absorbed a dozen conversations going on at once, and soaked in a potent sense of artistic community that is the perfect evidence of how wrong some of the art writers around this town are when they describe our artistic community as the visual arts’ world equivalent of the Island of Lost Toys among other negative things. Powerful and vibrant artistic community, emanating from the space itself, a spectacular gallery setting doing what art galleries have done for many of the District’s neighborhoods: leading the way towards the urban renewal of an entire community. Intelligent and groundbreaking artistic community, rising from the directors of that space as well; Jamie Smith and Leigh Conner, not only hardworking gallery owners and directors, but forward thinkers who are in the middle of putting Washington, DC on the international art scene via the (e)merge art fair. Talented and sharing artistic community, spilling from all the artists who came to the event and the many who sent in their best wishes. In that event we saw not only many of the artists in the first book, but also many others who were there to help celebrate the occasion itself. Caring and generous artistic community, showcased by the multiple offers from other art spaces to host book signings and events related to the artists in the book. I had not intended for this event to be a book sale event, but rather a celebration of the book itself, and only brought a handful of books with me, expecting that most folks would show up with their own copies, ordered online. For whatever reason, online outlets such as Amazon had quickly run out of their pre-publication orders, and most people had not received their copies, and thus the ones that I had brought with me, which I had purchased from the publisher directly, sold out within a few minutes. I am told that Amazon has now begun shipping orders and have been re-stocked by the publisher. You can order a copy here or though your local neighborhood bookstore. I also plan to have a couple more book signing events in the near future; stay tuned for locations. Thank you to all of you, and now the work for volume two is about to begin! Synergy is an exhibition of artwork by the Torpedo Factory's 2011 Visiting Artists - who were selected this year by yours truly! 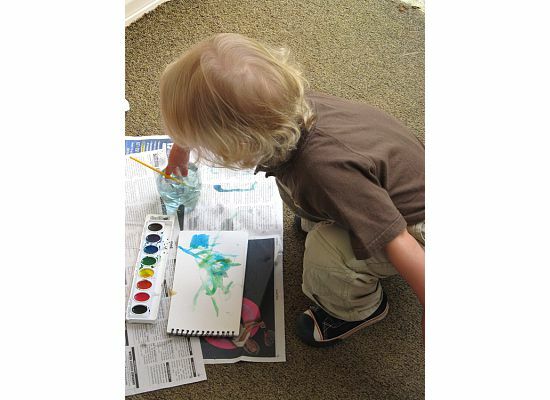 Additional information: To learn more about the Visiting Artist Program click here. The Torpedo Factory Art Center presents this summer’s 2011 artists in the Visiting Artist Program in an exhibition entitled Synergy. The Visiting Artist Program, the Torpedo Factory Artist Association’s residency program, invites artists both emerging and experienced from around the nation to become a part of its art-making community for a summer. This year’s juror, F. Lennox Campello, international award-winning artist, author of leading art blog Daily Campello Art News, curator, art critic, and writer in Washington, D.C., and Philadelphia, PA, chose 11 artists for the 2011 summer program. This residency awarded these artists with the opportunity to create in a Torpedo Factory studio from June until August for one, two, or all three months. This year’s selected artists are: Mark Thomas Anderson (Arlington, VA); M. Chava Evans (Baltimore, MD); Allison Long Hardy (Woodbridge, VA); Katie Latona (Champaign, IL); Heather McCaw (Washington, DC); Emily Moorhead (Cincinnati, OH); Linda Morrell (Castleton, NY); Liza Myers (Brandon, VT); Drew Parris (Stevensville, MD); Fierce Sonia (Alexandria, VA); Kazaan Viveiros (Alexandria, VA). Synergy stems from the cohesive objective expressed by the visiting artists to fill their time at the Torpedo Factory Art Center (TFAC) with new audience exposure, fresh inspiration from within the TFAC and abroad, and productive studio time that, in totality, amounts to an influential and wholesome experience. Conversely, their synergy translates into quite diverse works that ranges from detritus-based installations to graphite renderings. The exhibition Synergy is centered on this aspect and displays artwork created by each artist during residency and presents interviews conducted at the start of summer on each as well. The exhibited imagery portrays each artist’s perspective and the questionnaire conveys each artist’s anticipations and aspirations for the program in a literary art form. 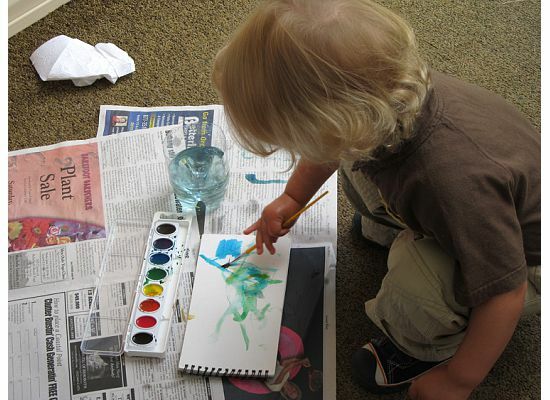 The visiting artists’ unique creativity and individuality permeates through while collectively they comprise this summer’s 2011 Visiting Artist Program. Join us August 11th from 6-9pm for the opening reception to Synergy held in conjunction with the Torpedo Factory Art Center’s (TFAC) Second Thursday Art Night. Come visit Site 2 and 3 Galleries on the second and third floors of the art center and view synergized art, read insightful interviews, and talk to the visiting artists! The Smithsonian American Art Museum acquired three furniture pieces in forged iron and cast glass for its permanent collection of notable American craft and decorative arts. The two Cafe Chairs and Arthropod Side Table by Maryland Artist-Blacksmith Chris Shea will be on exhibit at the Renwick Gallery in Washington, DC beginning October 1, 2011. The Cafe Chairs have become a signature piece for Shea, with a form derived from traditional bentwood furniture but executed in hot-forged steel, with joinery details more common to large architectural ironwork than fine furniture. The seats are cast in thick contoured slabs of translucent green glass set directly into the iron. The table is of similar design, with the name “Arthropod” referring to the phylum of creatures (such as insects and crustaceans) known for their hard, segmented organic structures. Chris Shea designs and creates furniture, sculpture, and architectural metalwork at his forge and studio outside Washington, DC. In addition to the Smithsonian American Art Museum's Renwick Galllery, his work has been shown at Wexler Gallery in Philadelphia, Woodson Art Museum, Houston Center for Contemporary Craft, the National Ornamental Metals Museum, and at SOFA Chicago with Maurine Littleton Gallery. A native of Marblehead, MA, Shea studied at the Appalachian Center for Craft in Tennessee and at Penland School. He holds a BA in English from Cornell University. Chris Shea's glass work is created in association with the Washington Glass Studio and it's damned amazing in my opinion. Friday, July 15th was closing day for Anne and James Kim, who’ve run the Orchard Gallery and Framing shop on Norfolk Avenue for the past 10 years. Orchard Gallery was part of downtown Bethesda’s Art Walk, a monthly event whose participating galleries will now number at just eight, (and that’s including shops Bella Italia, Waygoose Redux and restaurant California Tortilla). “Though people appreciate the art, they are cautious about buying,” says James Kim, reflecting a trend that’s caused the demise of other Bethesda galleries, including the Fraser Gallery in March. 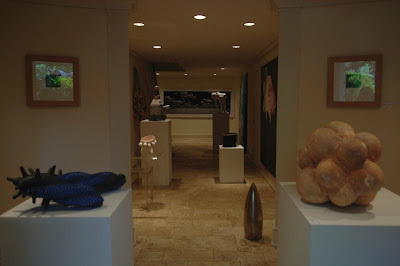 The art displayed in his gallery was all local. “There is no need to get national or international art. There are plenty of good artists here in Maryland, Virginia and D.C.,” he says. Read the report in Bethesda Magazine here. I apologize for sending this so soon after the Sunday night email, but the City Paper has a bad reputation for doing schlock journalism; This is the 2nd time I've been victim of it - last time was in 1996 -- the article that hatchet-man Kriston Capps put a link to in his piece. So my reason to send this now is to ask you to Send a Message to Michael (Schaffer - editor of City Paper) if you agree that I and MOCA DC were wrongly raked over the coals - I have threatened to sue, and Michael is looking into it. 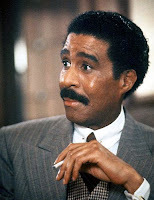 But a few messages here and there might make him clean up the collective City Paper act. Say what you want, but please do it now. go to this article, then let Michael know how you feel. Also, my email has been hacked and several messages were lost - so if you sent one and I didn't respond to it - please send it again and I definitely will reply - I always do, just out of common courtesy. Thanks for whatever support you care to give on this. Update: The WCP responds to the MOCA issue: Read David's letter and the CP response here (scroll to the bottom). ArtSee, DC's new fine art community, has just opened its online doors. ArtSee, the brainchild of founder and CEO Elizabeth Grazioli, will be offered in major cities that will provide arts enthusiasts with the “who, what, where, when, and how” of the art scene. 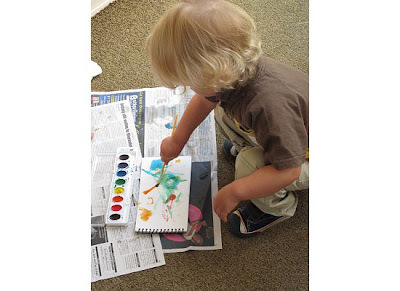 ArtSee is a full service community providing the opportunity for artists and art enthusiasts to discover news, events and information, exchange art and their ideas about art and hire ArtSee to promote art in their local communities. ArtSee’s motivated professional team will also provide creative promotional and event coordinating services for artists to help their presence grow within their communities. Through social media updates and a subscription to a monthly ArtSee e-newsletter, anyone can stay up-to-date with the art scene in the city where they live. This past weekend, ArtSee held its launch reception and inaugural art exhibition at Hillyer Art Space to celebrate its arrival in DC and the work of artists Kristin Lubsen, Blair Sutton, and Wil Scott. The event was a huge success with a turnout of over 120 supporters of the new community. 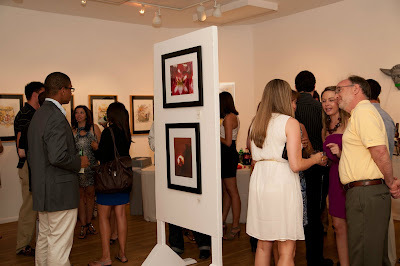 Guests enjoyed cocktails and hors d’oeuvres while engaging with the artists about their work. At the end of the party... a gorgeous piece of art - part of Conner's current Academy 2011 show. A million thanks to Leigh and Jamie: This is what community is all about and this is what DC is all about! The 100 Washington, DC Artists book is officially out today! Tune in later for pics from the book release opening party at Conner Contemporary. 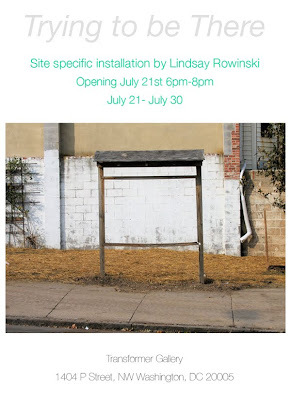 This summer marks the 10th anniversary of Irvine Contemporary and over 5 years at our 14th Street gallery location. We will be moving out of our gallery space at the end of August, and we are concluding our time on 14th Street by celebrating our artists and recognizing the community that has been the life of the gallery at this location (website info; info in pdf). Artist Tribute 2, opening on July 23, is our concluding exhibition on 14th Street, and will include special events a grand finale celebration on August 27. Saturday, July 23: Catalog launch and signing with Melissa Ichiuji. 6pm, gallery, during opening reception. Celebrate the publication of a retrospective catalog of Melissa Ichiuji's work (catalog essays by Martin Irvine and Sidney Lawrence). Saturday, July 30: Gaia: live mural painting, completion of alley street art project. 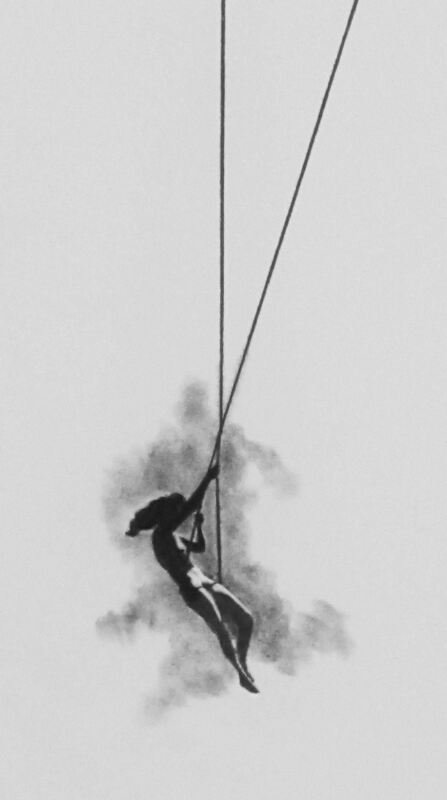 Saturday, August 6: Akemi Maegawa: performance. 1pm, gallery. Saturday, August 20: Alexa Meade: live painting performance. 1pm, gallery. Saturday, August 27: Exhibition Closing and Grand Finale Block Party. 6pm until ? Art and music performances to be announced. As I've noted before, Susana Raab, Tim Tate and I have been mentoring some exceptional young artists as part of the Fine Artists in Residence program at Strathmore. I've had a preview of the final exhibition and I can tell you that these four young artists have left me speechless with what they have created for this final show. Come and visit and prepare to be impressed! 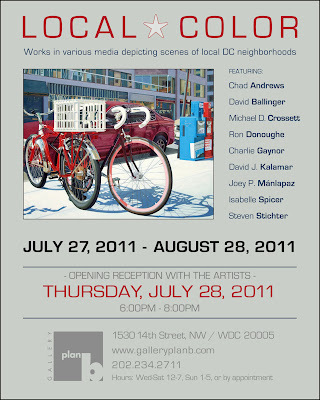 The opening is tonight, Friday July 22, 2011 from 7-9PM. I have a brand new video drawing in the exhibition. 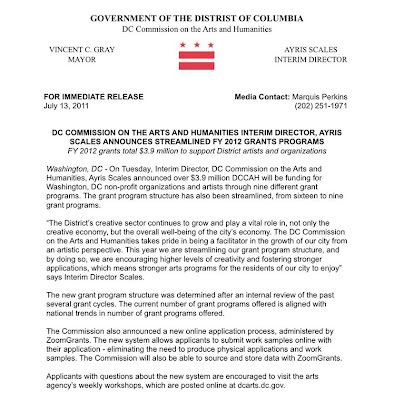 For the last few months, together with DC area art uberstars Susana Raab and Tim Tate, I have been mentoring emerging Washington, DC area artists Minna Philips, Solomon Slyce, Wilmer Wilson IV and Brittany Sims, as part of the Strathmore Fine AIR program - a very cool program which offers local visual arts talent in the DC area a mentoring hand by pairing emerging artists with established professionals in the community. 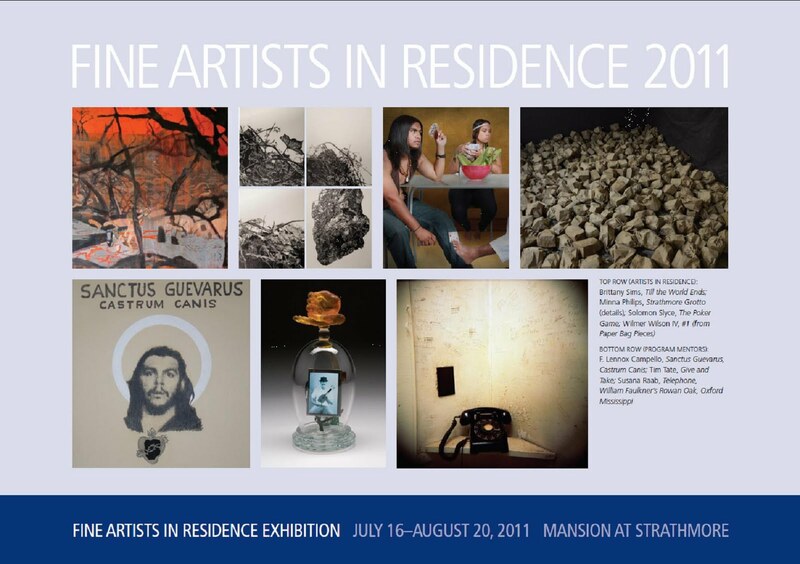 I was absolutely blown away by the talent of these four young artists, and after all the meetings, discussions, reviews and talks, they conclude their residency experience by unveiling new works in the Strathmore Fine Artists in Residence Exhibition, which opens tomorrow and runs through August 20 at the gorgeous Strathmore Mansion on Rockville Pike. According to the Strathmore release, in describing the four artists, we learn that Minna Philips “plays with perception by recontextualizing paradoxical objects, challenging the viewer to create original and unfettered interpretations of her work. She furthers this exploration by presenting an obscure and little-known Strathmore artifact, the grotto, in an equally obscure way. Minna distances the grotto from being identifiable by photographing it from a variety of angles and perspectives, scanning the images and, finally, meticulously sketching them on velum using pencil to recreate the look of black and white photography. The images are randomly mounted in a giant, gridded window in the Mansion, alluding to the exterior campus which inspired for the work. The final assemblage appears fragmented and abstract, further veiling the identity of a structure which is already out of context with the current use of the Mansion. Strathmore’s grotto was formerly a place of worship for the nuns of St. Mary’s Academy, who used the Mansion as a convent and school under the name St. Angela Hall. 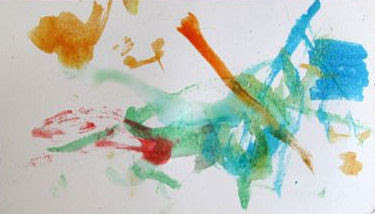 Minna will also present mixed media pieces that include glass prisms installed in shadow boxes. Using special lighting and mirrors, the glass prisms will reflect and distort drawn images. 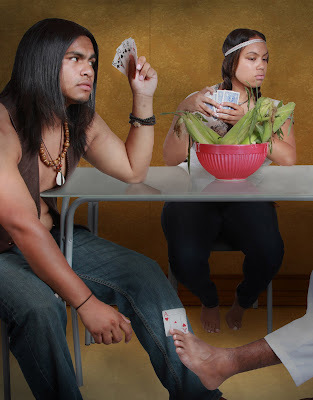 Solomon Slyce creates a dialogue about sensitive and emotionally-charged social issues through satirical photography. Seemingly benign and disarming, even comical, upon further inspection Solomon’s work incorporates nuanced themes such as interracial marriage, immigration, financial corruption in religious institutions and other themes germane to his identity as an African American male, city dweller and urban schoolteacher. He exercises supreme artistic control over his photographs to create carefully-staged environments, overseeing every detail, from costume, props and actor selection to set design. The Fine Artists in Residence Exhibition will feature existing work from his portfolio, as well as new pieces in which he addresses social issues and stereotypes by creating digital photographs in the likeness of distinctive techniques by iconic artists such as Andy Warhol, Irving Sinclair and Grant Wood. Installation artist Wilmer Wilson IV creates site-specific sculptural works using accessible consumer goods. By making use of everyday materials in his work, he transforms everyday experiences into aesthetic ones. 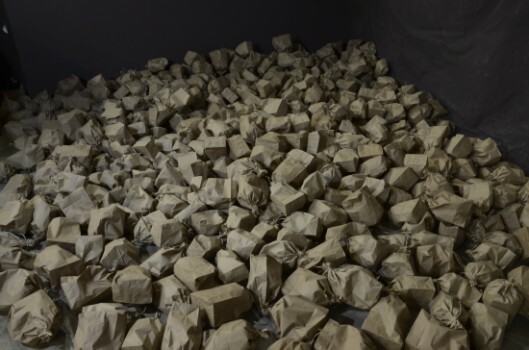 In the Mansion he will use more than 1,000 inflated paper bags to create a room-filling organic form. The installation will explore the implications that one oft-overlooked and mundane object can have when amassed in one place. Also included in the exhibition are photographs of his previous works, depicting paper bags pervading all aspects of his life. The images serve as documents of his non-permanent installations and also as contemplative compositions in themselves. Since I had been deeply involved with these artists for a few months, I thought that I knew what was coming to the exhibition, and yet I was completely blown away when I actually got a peek sneak at the show – while delivering my own work – did I mention that the show also features work by the three mentors? What Wilson delivered by the intelligent use of the air from his lungs is beyond visual belief – this young man is a genius and you should all start following his work now. His marriage of the always slippery world of the great conceptual idea and the actual delivery of that idea is as close to perfection as I have ever seen in these minimalist artists who find their materials where the rest of us fail to see art – remember this name. Slyce is a modern version of the photographer who sets up his scenes; he’s a marriage of the genius of Hollywood with the genius of such photog-stars as Cindy Sherman, etc. His images come in sets of two – his look at gambling looks at cool cheaters paired with symbols of gambling – humor, a sorely missing part of contemporary art, is part of his work, and it is Slyce’s brilliance which comes through in this difficult handshake. Both Phillips and Sims surprise the viewer by taking the art out of the expected context – Phillips does it by her dexterous handling of vellum to almost make it seem like a photographic installation. Sims does it with an understated elegance that push what Sam Gilliam did decades ago to a new contemporary dialogue. 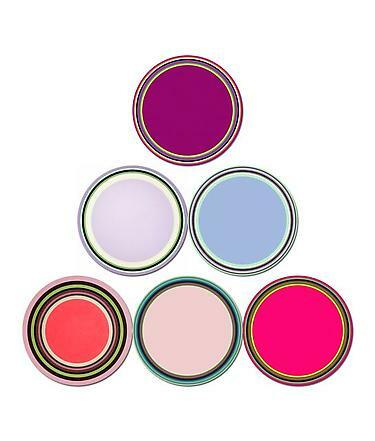 My kudos to both this great new program and to these four rising new stars. The opening is tomorrow from 7-9 PM. Classic Cuban "country music" or a "son guajiro" about the hard work involved in being a "carretero" - Interesting how the version made famous by Eliades Ochoa through the Buena Vista megahit is slightly different from the original version from the 30s. Kuba Kuba in Richmond: Fail! I had heard a lot of good things about this restaurant from my Richmond friends, so a while back, while delivering some artwork to a local collector, I dropped by and had dinner. The atmosphere is very trendy and somewhat hip, which is something different from most Cuban restaurants outside of NYC. It looked like a very cool restaurant which happened to serve (I was told) great Cuban food. I knew that something was wrong when I was served a basket of chips and salsa as soon as I sat down. I rationalized it as the fact that in Richmond, even a Cuban restaurant has to "normalize" and come down to the fact that a lot of people think that Mexico starts south of the border and there are no other culinary traditions elsewhere in the twenty-something other nations in the Americas... maybe they got tired of people asking for chips and salsa. Notice to Kuba Kuba: Cuban food does not include chips and salsa... perhaps a serving of mariquitas (fried, thin chips made out of plantains), but not Mexican tortilla chips - in a Cuban cuisine, a tortilla is an omelet. I ordered the most basic of Cuban dishes, which of course, came with the staple of Cuban food: white rice and black beans. There is a long cultural tradition assigned to this dish, and even its Cuban Spanish name (moros y cristianos or "moors and christians") tell you something about the dish (rumored to honor the 100th anniversary in 1592 of Queen Isabella's final victory over the Moors in 1492). I was horrified when my moros y cristianos was brought to me with the black beans piled atop the white rice. HUGE cultural gaffe! These two parts of this key Cuban dish are always, always, always served in separate dishes and only the eater can mix them, if he/she desires to mix it. When cooked together, a different dish, called "congri" is the result: Different dish, different flavor, different recipe. Overall, the food was acceptable, but far from stellar or memorable, although it is probably one of the few variants of Latin American food available to Richmonders... too bad the owners (I am willing to bet they're not of Cuban ancestry) miss the rich cultural tradition that goes along with proper Cuban food. Queen of Tarts. 4x20 inches. 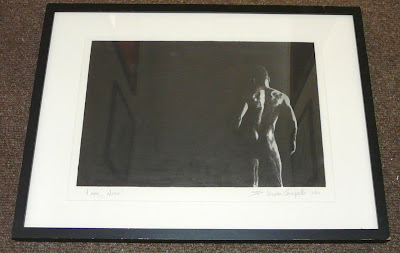 Charcoal on paper, c. 2011. 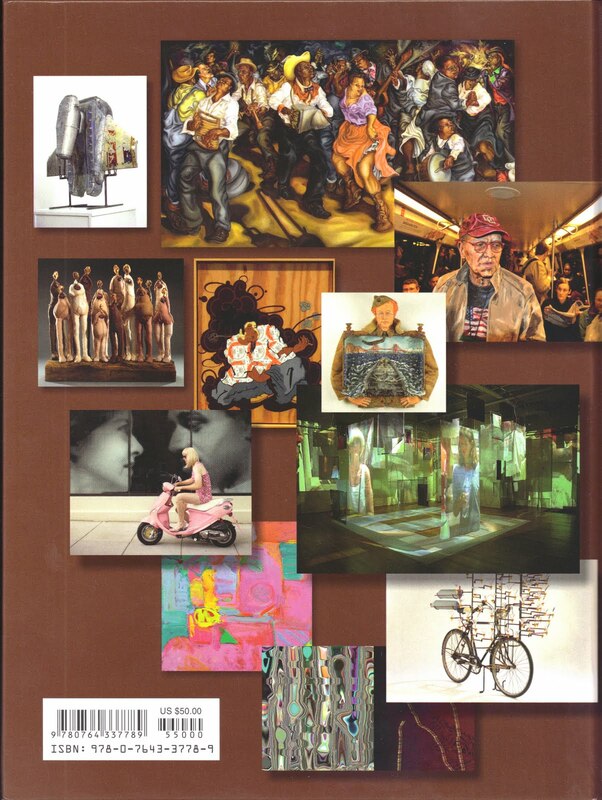 Here is the back cover of my 100 Artists of Washington, DC book. I am told that Amazon has been telling all those of you who pre-ordered the book that it will arrive to you either (1) this weekend or (2) mid August. Not sure what the deal is, but it is available now directly from the publisher and they ship it right away. I will have 20 copies that I've ordered (and received right away) for sale at the book opening party (July 23rd from 3-5 at Conner Contemporary, RSVP required), and some of those have already been reserved, so if you'd like me to reserve one for you for the opening so that you can get it signed by the attending artists, send me an an email. Why D.C. Needs an Emerging Art Fair? Why start a new fair for emerging art in Washington, D.C.? As collector Mera Rubell puts it, "Politics is not the only game in D.C., just like Hollywood isn't the only game in L.A. Washington spends more money on art than any other place on earth. Culture is a monster industry here, and D.C. is poised to become a powerful art destination. This city is a diamond in the rough." As the creators of the (e)merge art fair, which will debut in D.C. this September 22-25, we believe that the nation's capital is a burgeoning market for contemporary art. 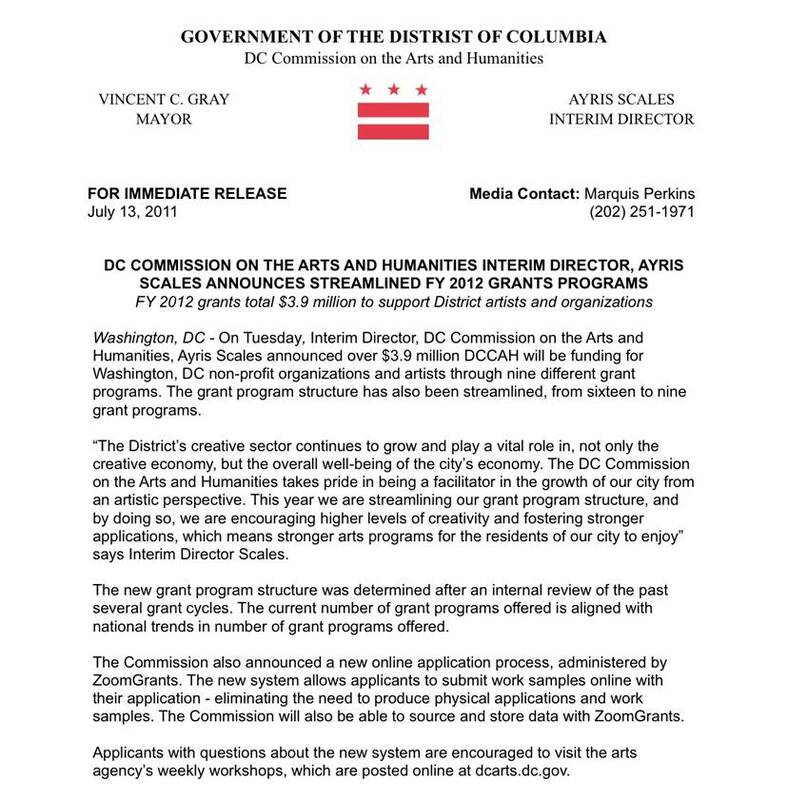 In recent years, D.C.'s art community has grown and diversified, while strengthening its interconnections and forging new relationships with the business community. Along with artistic advancement, the region's private business and tech sectors have expanded. The mutually reinforcing factors of creative artistic energy, entrepreneurial innovation, and economic growth provide a stimulating environment for emerging art. With enthusiastic support from D.C.'s museums, galleries, collectors, nonprofit spaces, city officials, and residents, this event is positioned to tap directly into the region's evolution. 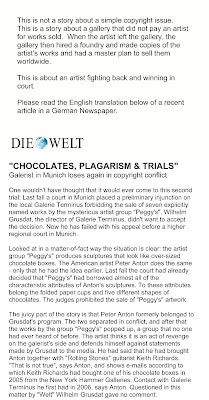 Read the whole article in ArtInfo here. 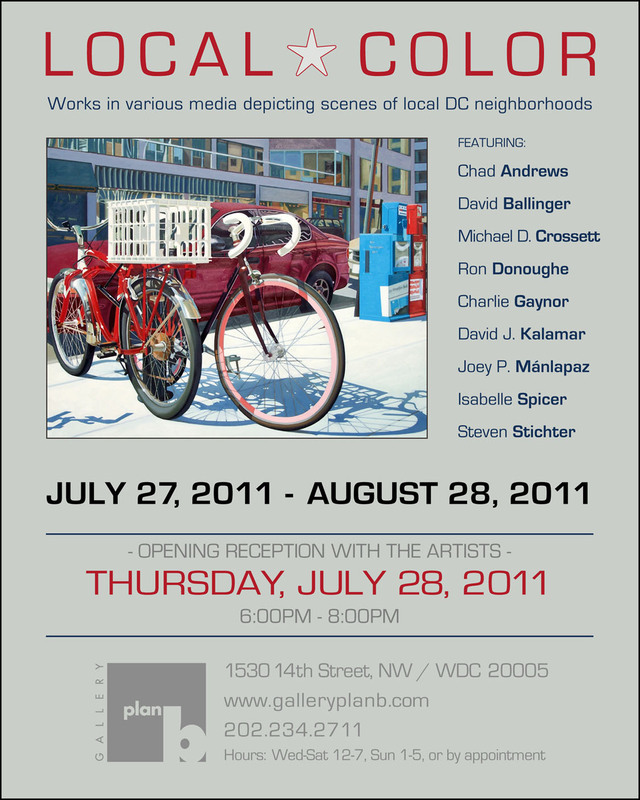 The opening is Friday July 22, 2011 from 7-9PM. I have a brand new video drawing in the exhibition. Are you an artist who would like to exhibit your outdoor sculpture work or other installation for an entire month? Are you a homeowner who would be interested in hosting a beautiful work of art in your front yard throughout August? If so, then the North Capitol Main Street Art + Music Walk wants to hear from you! Now in its third year, the annual North Capitol Main Street Art + Music Walk (formerly known as “First On 1st”) brings together residents of DC’s North Capitol neighborhoods with local businesses, artists and other creatives, and showcases the area as a whole to the entire District. Homeowners in Bloomingdale, Eckington, and Truxton Circle graciously offer up their lawns to serve as pop-up installation spaces throughout the month of August, as the neighborhood celebrates its culture of community – and its community of culture – by showcasing live music, great art, and fine foods from area restaurants. This year, we have a goal of including twenty (20) artists and homes to display art, and there will be four stages set up to feature live performances during the kick-off celebration on Saturday, August 6. If you’re interested in taking part, please e-mail josef@pinklineproject.com to get involved — and we`ll see you at this year’s North Capitol Main Street Art + Music Walk! 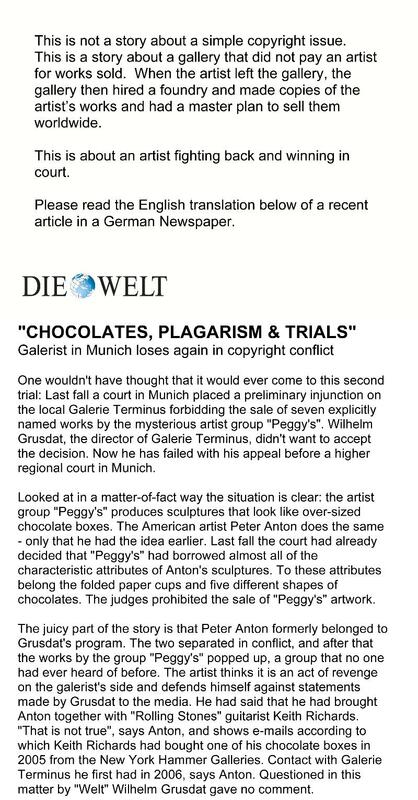 Click on the image below to get a better view of the curious case of American artist Peter Anton and his former German dealer. 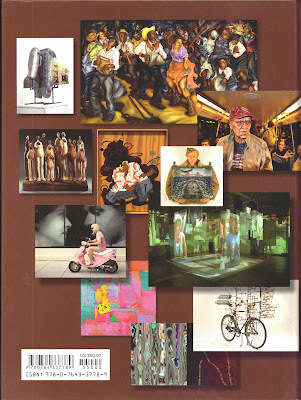 Artomatic @ Frederick Announces Dates! Artomatic @ Frederick will take place this fall from September 28 - November 6, 2011. Artist Registration begins August 1st. Join them at their gorgeous new space. Their first show there is "Summer Selections". Join them for summer cocktails in their new gallery space on July 14th 6-8pm. A British art dealer has this gorgeous charcoal drawing of mine, circa 2000 up for auction here and it's going for a steal! Hurry, the auction ends in less than 2 days! The WCP's Kriston Capps has a very interesting article on a new and fresh concept on a DC satellite art fair to the (e)merge art fair - read it here. When artists Alex Ventura and Victoria Milko host the But Is It Art? fair from Sept. 22 to Sept. 25, they won’t be putting that question to their artists or audience. They know what they’re doing is art. Their DIY fair is asking a pointed question about another art fair taking place over the same weekend: the inaugural (e)merge art fair. This is a first heard for me - check out their website here. When Art Basel Miami Beach started in Florida less than a decade ago, it was just them (Art Miami had been around for years, but at a different time). The idea proved so good, that now there are 25 satellite art fairs around the ABMB magnet and even the original art fair (Art Miami) changed their schedule to align with ABMB week in December. The announcement of the first volume of the three set compendium (100 Washington, DC Artists) caused quite a bit of stir further fueled by my re-write of a drive-by article on the subject. One of the commenters in one of those articles noted something along the line of "who cares, only 100 copies will sell". And yet, the pre-orders for the book have been so unexpectedly high that now the book shows out of stock on Amazon until they get their orders fulfilled! in their distribution center. By the way, for those of you who ordered the book online (including whoever apparently ordered 100 copies! ), the publisher tells me that because of the fact that the book just arrived in the publisher's warehouse in PA just last week, it will take anywhere from 3-6 weeks for all distribution centers (both online and brick and mortar bookstores) to receive their stock and replace it in their inventory. So the book will be back in stock at Amazon as soon as they receive their current orders and their additional orders. By the way number two: Pencil in 23 July from 3-5PM for the book release party in DC - more details here. - ACADEMY 2011 opening + (e)merge party: 6-8pm. First: Saturday, July 9th - the panel at 5pm; party 6 to 8pm. Conner Contemporary Art and (e)merge art fair will host a panel discussion: Collecting and Emerging Art. Panelists include: Robert Shapiro, collector, Henry Thaggert, collector, Melissa Ichiuji, artist, Alberto Gaitan, artist, Victoria Reis, Director, Transformer Gallery. The panel will be moderated by Helen Allen, co-director of the (e)merge art fair. The (e)merge panel discussion begins at 5pm; directly followed by (e)merge art fair party and Academy 2011 opening. ACADEMY 2011, is Conner's 11th annual invitational survey of outstanding work by MFA/BFA students from the Washington/Baltimore area. Artists: Sarah Allison, Forest Allread, Emily Biondo, Woojin Chang, Caroline Covington, Michael Dotson, Dan Gioia, Ginny Huo, Adam Junior, Libby Landauer, Linling Lu, Jon Malis, Jonathan Monaghan, Elle Perez, Melissa Prentki, Camilo Sanin, Samuel Scharf, Sierra Suris, Virginia Wagner. That's Linling Lu, One Hundred Melodies of Solitude - Lighthouse II, acrylic on canvas, c. 2011 on the left. 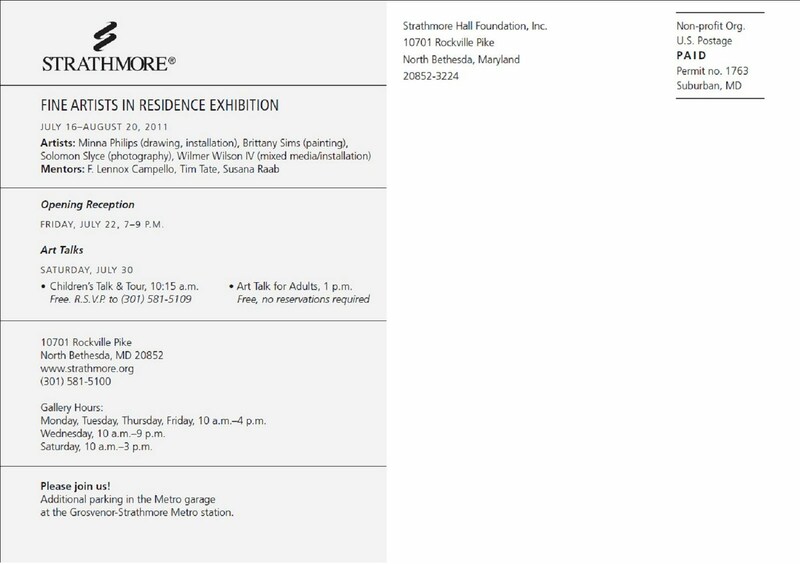 Representing institutions: American University, Corcoran College of Art and Design, George Washington University, Maryland Institute College of Art, and University of Maryland. Check out the exhibition online here. Art Deck-O: DC Playing Card Originals Artists from the Washington DC Playing Card Project Opening Reception: Friday, July 8, 6–8:30 pm at Touchstone Gallery. This past winter 54 of Washington DC's finest artists came together to produce wildly creative designs that form a playing card deck unique to our area. The culmination of these efforts was then published in a deck of fully functional playing cards with traditional suites of diamonds, hearts, spades and clubs. Although decks of cards--designed by artists or created in a particular theme--have been around for centuries, this latest variation on the concept has given DC area artists a fun way to showcase their individual expressions in card form. 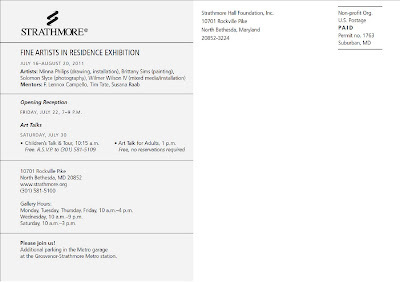 Both the originals and the decks of cards will be on exhibit at Touchstone Gallery during the month of July as Touchstone partners with Art In Hand TM to promote the work of artists here in DC. Each deck is composed of a fantastic array of genres and mediums which are a big hit with artists, school teachers, magicians, game players and art lovers everywhere. Each deck is like holding an Art Gallery right in your own hands. Washington is the third city in a series of art decks created by Art In Hand TM, an arts publisher out of Charlotte, NC. Founded by Dione Goyette in 2009, the first project united artists in the Charlotte area and then inspired a deck in Portland, Oregon. This imaginative and collaborative project isn't just fun and games. So far, participating artists in Charlotte and Portland can boast that their work is in the homes of over 3,000 and 5,000 people respectively. Decks in both cities will go back for second printings this year. 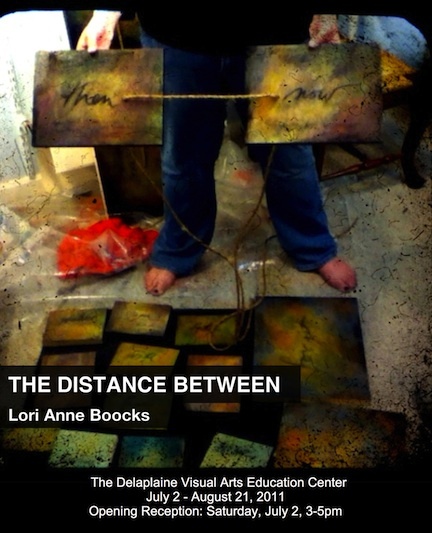 Saturday, July 2 from 3 to 5pm is the opening reception for The Distance Between from Germantown artist Lori Anne Boocks. Using varying lengths of rope to mark both time and emotional space between opposing or related concepts, this installation invites viewers to consider where these intersections occur in their own lives. 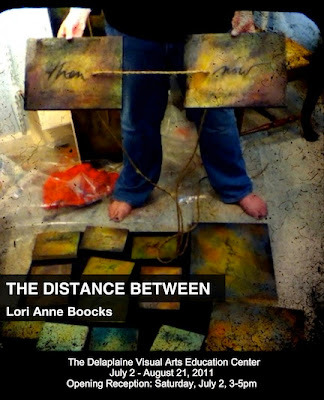 The Distance Between builds on her on-going series of paintings called textscapes that incorporate the written word. July 2 – August 21, 2011.